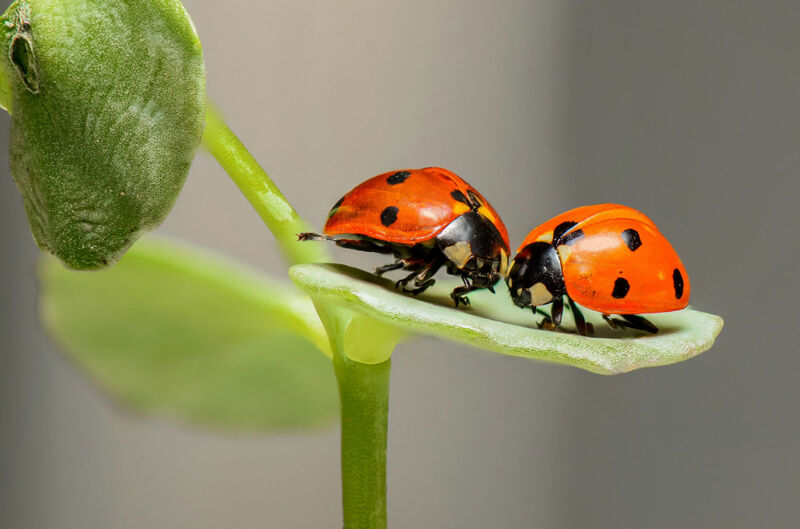 Scientists estimate that populations of ladybugs in the United States and Canada have declined by 14 percent between 1987 and 2006. Insects are undergoing a massive decline and that spells trouble for humanity. In a new report, scientists warn of a precipitous drop in the world’s insect population. We need to pay close attention, as over time, this could be just as catastrophic to humans as it is to insects. Special attention must be paid to the principal drivers of this insect decline, because while climate change is adding to the problem, food production is a much larger contributor. We have, it appears, a lot to learn to avert the looming insect apocalypse. Here are five critical lessons. 1. Small things tend to get overlooked. While the volume of scientific research on the threat of species extinction is growing rapidly, most of the focus has been on the declining population of fish and large mammals. Compared to larger species, insect species and their populations get very little attention. In making their report, the authors conducted a comprehensive review and found 73 historical studies of insect decline. That’s a tiny fraction of the reports written about the population loss of larger species. Yet arthropods (insects, spiders, crustaceans) account for about half of the world’s animal biomass — 17 times more than humans. Forty percent of insect species are now threatened with extinction. When it comes to endangered species, large mammals get all the headlines, but insects are essential to the underlying web of life on which larger creatures depend. About 60 percent of bird species rely upon insects as a primary food source, and birds consume up to 500 million tons of insects every year. Moreover, it is estimated that 80 to 90 percent of wild plants depend upon insects for pollination. And while some insects feed off domesticated crops, other insects help to keep pest populations under control. A 2006 study estimated that insects in the U.S. provided “ecosystem services” worth $57 billion a year. These include pest control, crop pollination, and serving as a vital food source for fish and small wildlife. 3. Environmental degradation is accelerating. Climate change, pollution and the ongoing destruction of forests, wetlands, reefs and other vital habitats are taking an ever-increasing toll on nature. And it’s not just insects; environmental degradation is accelerating and rapidly diminishing non-human populations, including birds, fish and large undomesticated mammals. The World Wildlife Fund estimates that wildlife populations, on average, have declined 60 percent since 1970. The International Union for Conservation of Nature now classifies 26,000 species as threatened with extinction, and leading scientists publicly warn that a “sixth mass extinction” has commenced. Insects are essential to the underlying web of life on which larger creatures depend. No one should underestimate the impact that rising greenhouse gas emissions are having on the web of life, but the authors of the insect report indicate that the three largest drivers of insect depopulation are, in order of importance: 1) habitat loss attributable to agriculture and urbanization; 2) pollution, mainly caused by pesticides and fertilizers and; 3) the introduction of invasive species. Climate change, which many believe is the largest driver of ecological ruin, ranked only fourth as a driver of insect decline. The insect decline, in one form or another (including climate change), is attributable to humans. The principal drivers of insect extinction have a common denominator. Simply put, the insect decline, in one form or another (including climate change), is attributable to humans. Our growing numbers and our appetites are driving insects to extinction. There is no letup in sight. World population, presently 7.6 billion, is expected to reach nearly 10 billion by mid-century, and the world’s middle class is expected to rise at an even faster rate. Our demand for food, and particularly our appetite for meat products, is leaving less room for other creatures, including insects. Humans already use a land mass about the size of South America to produce crops for consumption and an area nearly the size of Africa to feed our livestock. Add in the pesticides and fertilizers that we depend upon to boost crop yields, and it’s no wonder that insect populations are suffering mightily. If insects head toward precipitous decline and extinction, humans can’t be far behind. The authors of the report on insect loss warned that, “Unless we change our ways of producing food, insects as a whole will go down the path of extinction in a few decades.” Curbing our reliance on pesticides and fertilizers could reduce the loss of insects, but it’s our ever-growing need for higher crop yields that has given rise to their use in the first place. Given enough time and capital investments, the farmers of the world might be able to adopt sustainable farming practices without reducing crop yields, but we may not have the luxury of time. To avoid insect apocalypse, we need to reduce the size of our agricultural footprint. That should begin by preventing runaway population growth and the unsustainable food demand that would go with it. We should increase our support for family planning programs that help to prevent unplanned pregnancies at home and abroad. At present, nearly 40 percent of the pregnancies in the world are unintended. We should also commit to reducing our meat consumption, particularly beef. Meat-based diets require the use of far more land and water and result in much bigger environmental impacts — from greenhouse gas emissions to land degradation — than plant-based diets do. If insects head toward precipitous decline and extinction, humans can’t be far behind. We need to advance our thinking about insects, their importance and what can be done to save them. 30 Comments on "The Insect Apocalypse Is Coming: Here Are Five Lessons We Must Learn"
What’s the percentage drop from 1950 to 2019? What’s the percentage drop of moths, flies, butterflies, and going somewhat larger, what’s happened to bats. I guess more people are concerned with where they can get their after market muffler installed than what happens to the wild life. As insects die out, there will be ultimate survivors. Those will be immune to insecticides (one reason they survived), and they will, in short, be monster bugs that defy our defenses. We need a new planet. and small. Import and Domestic. complete with optional set of rings? We won’t be undersold and financing is available. How about a new blue planet? come on down to Jeb’s Planet Lot. Remember the old line, the only thing left alive after a nuclear war will be the cockroaches, and presumably, other insects as well? Now it seems, ‘we’, and by we, of course, I mean Delusional Davy, are on track to manage something I thought would have been well impossible. Namely, it seems we are not only going to finish off most of the higher mammals, fish, mega-fauna (mostly comple as of 21st century), but the fooking INSECTS as well. GG Bayer Agro-chem, monsanto and friends. I always thought, as bad as humanity is, at least the insects would still be around after we were done. Now…, not not sure even those will be around. Still haven’t heard anyone talk about an impending crash in the cockroach population. Or locusts. Or Delusional Davy. Wonder those those are still on track to survive? Anon, I suppose that the roaches will survive. Maybe the rats also. But they may mutate to human size. There are also many species that live underground in the deep caves. They might not even notice the change. Something will survive to seed the next ecology, but it will obviously not even be close to the one we are killing. But then, none of us will be there to see it. Enjoy what we have while we still have it. I am. Perma, unfortunately, it is too late. Humans will continue to bur FFs as long as they can. $200 oil will not stop its use. I may cut it down some, but it will not end. Instead of buying that new $1,000 I-phone this year, it will be spent on gas. The few countries that could make a difference, are the ones that will continue to burn the stuff. Nothing will save the environment but we can slow down the process and maybe keep it from getting as bad as it might. Tree huggers sometimes romanticize about the end of the world and a nature rebirth. The reality is the end of the world would likely be very dirty and destructive causing far more damage than a slower fading away of techno human civilization. I see the ‘food chain’ rearing everywhere. North to Canada, Alaska, in Summer. Having spent a few hellish weeks fighting black flies in Ontario, I can’t imagine it getting worse. If you plan such a trip North, don’t forget your bats. Eat lots of raw garlic. Always carry a Jesus type cross. Do yoga under your desk instead of masturbating. Never think unclean thoughts or read an entire Davy post. Lol, bob, you got pegged. Rich jet setting fake green liberal whines about Davy. BTW, I saved your $100 oil prediction. That $100 one is better than the $200 last one. Maybe my criticism is getting through. Extremism does not pay. Did I mention I’m the only one here with a Learjet that’s voting for Tulsi in the next election? This is not a JuanP post. Davy is lying again. He does that a lot. One good way to balance the worlds population would be to stop any medical care for children under around 4-5 years old. This method is called eugenetic, social darwinism or racial hygiene…AND it is not popular among monotheistic religions or socialistic/humanistic ideologies, which all seem to favour the principal that the more we are the better. This is a redundant and boring JuanP troll game. Hey, sunspot (juanP), this is what your puppet master JuanP does. He will come on and do a couple of rapid fire troll comments like bellow that are very close in time. The perve has gotten so lazy and sloppy it is easy to catch him being stupid and redundant. Liar, liar, Trump’s “pubic hair transplant” is on fire. So you see, Davy dearest, the difference between Chump and Obama is one is a pathological liar. Birds of a feather all flock together. Besides the 5 reasons stated there is something disturbing in an article in the German paper DIE WELT: The 30,000 wind turbines in Germany kill an estimated number of 5.3 billion insects per DAY. Indirectly proven by the fact that there are specialized service companies which clean the rotor blades, some even with helicopters, since otherwise the blade profile does not work any more as it was supposed to be. The article is not only German but also behind a paywall. I consider that so important that I will attach a machine translated summary – just too lazy to type it all. Please let me know what you think. Scientists have identified another suspect for insect mortality. Nature conservation associations such as BUND and Greenpeace will certainly not like the new look at the question of guilt at all. This time, the usual suspects from the agricultural industry are not being pilloried with their pesticides. This time, the focus is on an industry that is one of the favourites of organic associations: The wind power industry. According to a model analysis by the German Aerospace Center (Deutsches Zentrum für Luft- und Raumfahrt; DLR), the approximately 30,000 wind turbines in Germany could be responsible for the death of 5.3 billion insects a day during the warm season. Franz Trieb, an expert in energy system analysis at the DLR Institute of Technical Thermodynamics, estimates that the losses caused by crossing the rotors are “at least 1200 tonnes per year”. The investigation is still based on a relatively thin data basis. However, if DLR’s analysis proves to be accurate, a reassessment of the most important energy system transformation technology by far would be unavoidable. “There have only been a few studies on the interaction between wind power and insect migration,” says Matthias Geiger of the Zoological Research Museum Alexander Koenig (ZFMK) in Bonn, which belongs to the Leibniz Institute for Animal Biodiversity. The fact that there are conflicts between wind power and nature conservation is not new: The killing of birds and bats by rotor technology has already led to restrictions on the operation of wind turbines in many places. Since around 90 percent of all new wind power plants in federal states such as Hesse and Rhineland-Palatinate are built on wooded areas, criticism from forest conservationists is also increasing. Should it now become apparent, however, that wind turbines also play a substantial role in the extinction of flying insects, this would have a new quality. After all, a study by the Entomological Association Krefeld suggests that the biomass of insects has shrunk by 75 percent in the past 27 years. From DLR’s point of view, the loss of insects by wind turbines may have an order of magnitude “which could well be relevant for the stability of the entire population”. It follows from this that the German government should take immediate action in accordance with the precautionary principle set out in Article 20A of the Basic Law, or at least initiate further investigations. For according to the precautionary principle, it is not necessary to be convinced that there is a risk. A sufficient, factually justified suspicion is sufficient. And this is undoubtedly the case with the DLR analysis. In a recent presentation to the German Physical Society in Berlin, Trieb described the state of insect research, i.e. entomolgo research. According to this, insects fly in high, fast air currents for the migration that serves reproduction. On their way to their breeding grounds, they use wind paths millions of years old, but for around 30 years they have been leading precisely through the rotor paths of large wind turbines. Because they were placed where there are fast air currents. Contrary to early environmental legislation, the rotor height of up to 200 meters is not “insect-free”, but on the contrary an “insect migration layer”. In the calculations, DLR refers to the results of “catch flights” over Schleswig-Holstein and observations over southern England with a vertical insect radar. From this, the scientists conclude a density of up to nine kilograms of insects per cubic kilometre. Everybody who googles words like “rotor blade cleaning” knows that this five percent is a considerable number. In the meantime, an entire industrial sector has developed that specializes in cleaning rotor blades, primarily scraping off dead insects. Müller&Sohn from Berlin works with industrial climbers. A company called Helitechnics even uses helicopters. The Spanish company Blade Cleaning warns wind power operators of losses of 20,000 euros per year if they do not have the wings cleaned regularly. The Spaniards illustrate the danger of a yield-reducing stall with photos of leaf edges covered with brown crusts of dead insects. Every citizen who is caught killing a wasp or specially protected insect species must expect a fine of between 5000 and 50,000 euros, according to the catalogue of fines. The daily five to six billion insect killings of the wind power industry, on the other hand, were not an issue for the nature conservation authorities: Nobody had this on their screens so far. The first indications that wind turbines and insects have a problem with each other were already there at the beginning of the energy revolution. “Insects can halve the power of wind turbines,” warned the Nature magazine in 2001. The fact that environmental journalists only had the needs of wind turbine operators in mind, and not those of insects, may have something to do with the low prevalence of the then young technology. Today the problem is different: According to DLR researcher Trieb, the 30,000 facilities in Germany “are mathematically like a 200-metre-high wall that runs 750 kilometres through Germany – every flying insect has to pass through them at least once”. The wind industry accuses the study of deficiencies in content: “The DLR publication only makes model calculations and rough estimates of the biomass of flying insects,” explained the German Wind Energy Association (BWE): “Neither the actual number of species nor the geographical distribution are taken into account. The published findings were thus “largely based on projections which were not based on empirically proven data”. This is actually a problem: nobody knows how large the total amount of insects is, and thus nobody can say exactly whether 1200 tons of dead animals per year make up a high or low percentage. The thirst for knowledge on the part of the competent authorities is very limited in this respect. “No further study in this field has so far proven or suggested an urgent need for research from a nature conservation perspective,” the Federal Agency for Nature Conservation (BfS) explained in response to WELT demand. Thus the authorities’ view seems to follow a contradictory motto: We do not yet know so much about it, so we do not see any need for research. The Federal Office for Nature Conservation would only consider this further if “research by third parties” were to provide new findings or if accidental indications were to emerge in accompanying research on nature conservation. Another argument used by the authority to justify its inaction also seems open to attack. For example, the Federal Agency for Nature Conservation declares “that the decline of insects is a development that can be observed worldwide, even in regions where there are no or hardly any wind turbines”. In view of the fact that, to the knowledge of insect migration researchers such as Cecil George Johnson, many flying insects travel even intercontinental distances in large swarms, an insect decline far away from wind farms could nevertheless be traced back to these very regions. Certainly, habitat loss and agriculture have a large and probably also outstanding share in insect mortality. Nevertheless, the seemingly real possibility that the wind power industry may play a substantial role in the development of the industry should urgently suggest further investigations. After all, the damage could be much higher than DLR’s calculations show. This is because DLR researcher Trieb did not take a number of potentially lethal effects into account. For example, wind turbines could have an attractive effect through lighting, colour and heat. The insect residues on the rotor blades could have a hormonal attracting effect on other animals. The negative pressure on the back of the rotor towers, which causes bats to burst their lungs, could have a similarly deadly barotrauma effect on the tracheal system of flying insects. That’s not all, says Trieb: “If females, who can lay several hundred eggs, are hit by a rotor blade during migration and thus shortly before the egg is laid, this has a greater effect on the next generation with a corresponding leverage effect. The entomologist Lars Krogmann considers the fears to be exaggerated: “Especially the groups recorded by Red Lists and dramatically reduced such as ground beetles, grasshoppers, dragonflies, wild bees, butterflies, hover flies are usually hardly to be found at such heights”. The consequences of habitat loss, monocultures and eutrophication are “clearly more conclusive and relatively clearly documented”. Nevertheless, DLR calculations should be sufficient to stimulate further studies. Thomas Schmitt, Director at Senckenberg Deutsches Entomologisches Institut (SDEI), said on request that he had previously only been able to look through the DLR paper “in quick succession”: “The analysis seemed clean to me”. Further investigations were desirable. Genetic methods could be used to determine the species concerned. Because, according to Schmitt, “the rotor blades are pretty full after all”. We kill them on the ground, we kill them in the air. It’s what we do . Die Intensivierung der Landwirtschaft mit dem Einsatz von Pestiziden oder Monokulturen auf den Feldern gilt als Hauptgrund. The study originates from the DLR (German NASA), sounds rather independent. The core of their argument is that during the Summer ten times the entire volume of “German air” (up to 2000 meter) passes through a rotor area. One passing yields to 5% of the insects getting the “ISIS treatment” (or similar US mercenaries), or so the assumption goes. Professor Lars Krogmann vom Staatlichen Museum für Naturkunde in Stuttgart ist skeptisch: „Wir kennen die Gesamtzahl aller Insekten nicht einmal annähernd. Here an expert claiming that the amount of insects is completely unknown. On top of that, most insects do not fly at wind turbine altitude, they prefer to stay close to vegetation. Windturbines are only around in large numbers since a decade (in contrast to cars), but the decline of insect population is much older, so turbines can’t be a decisive factor. Dabei sagt Trieb selbst, dass die Studie keine genaue Schuldzuweisung zulasse. „Man kann zurzeit aus unseren Zahlen weder ableiten, dass die Windenergie eine nennenswerte Rolle beim Insektenschwund spielt, noch, dass sie daran unbeteiligt ist“, so Trieb. In the end the author backtracks himself and says no definite conclusions can be drawn yet. Btw the wind industry denies that rotor blades need to be cleaned. Rain suffices.